All articles posted in November 2018. Among the American Thanksgiving traditions of turkey, pie, and football is the Macy’s Thanksgiving Day Parade in New York City. For 2018, the parade welcomed a newcomer — Super Saiyan Blue Goku from Dragon Ball. At 56 feet tall, 70 feet long and 36 feet wide, this massive Saiyan required 90 people to handle and selected to promote the upcoming film Dragon Ball Super: Broly, which premieres later this year in Japan. It’s the first time a manga character has appeared in this 92 year-old parade. There’s never been a Pokémon film like it before. Detective Pikachu is a whole new adventure, based on the recent video game for the Nintendo 3DS. The raucous Ryme City is no place for a cute and cuddly Pikachu, but this isn’t just any Pikachu, it’s Detective Pikachu and, only one voiced by Ryan Reynolds, can navigate the mean streets. With Justice Smith by his side, searching for his missing father, this duo is expected to be a Pokémon journey like none other. Detective Pikachu is expected to hit theatres May 11th, 2019. 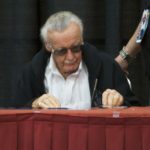 Stan Lee at Alamo City Comic Con in 2014. Stan Lee, the mastermind behind some of Marvel’s greatest superheroes, passed away Monday at age 95. Lee, who worked with Steve Ditko and Jack Kirby, created new superheroes under the Marvel banner, many of which continue to star in print, digital and film to this day, including Spider-Man, the Hulk and Iron Man. Continuing to work into his twilight years, Lee made appearances at fan conventions and cameos in movies based on his characters. With only a few months to go before the release of Kingdom Hearts III, Square-Enix has dropped another trailer of the long-awaited game. Scenes included are from Tangled, Winnie the Pooh, Big Hero 6 and Pirates of the Caribbean, along with a glimpse at some of the new mini-games, as well as interactions with Organization XIII members Demyx and Vexen. Kingdom Hearts III has a release date of January 29th, 2019 on the PlayStation 4 and Xbox One. 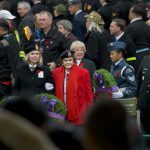 Waiting to lay wreathes at the cenotaph in Victory Square on November 11th, 2017. On Sunday, November 11th, 2018, communities throughout Metro Vancouver will hold ceremonies to honour the men and women who serve and have given their lives for Canada for Remembrance Day. This year marks the 100th anniversary of the end of World War I on November 11th, 1918. Burnaby – Remembrance Day Ceremony at North Burnaby Cenotaph in Confederation Park (Willingdon Avenue and Penzance Drive). Starts at 10:40 am PST, followed by the ceremony at 11:00 am PST. New Westminster – Ceremony at the Cenotaph in front of New Westminster City Hall (511 Royal Avenue). Starts at 10:25 am PST.